Inspired by our Every Picture Tells a Story contest back in 2007, this new contest has a fun twist that involves collaboration and competition. The event has three parts, and the first part starts now! Please read below for details and instructions, and check back periodically for updates throughout the contest. PART 1. 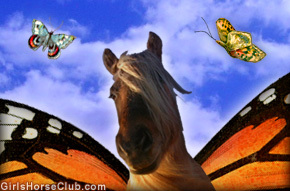 SUBMISSIONS CLOSED on Sunday April 17th at 6pm PT for horse artwork, photos or photo illustrations created by you. Entries are posted in the Gallery. Your submission must be your original creation—horse artwork drawn or painted by you, a photo taken by you and/or a photo illustration created by you. Submissions most likely to inspire stories for Part 2 will be selected for the contest. You may submit more than one image, but only one (1) image per artist will be posted in the Gallery. Please use the Gallery Submission Form for entries, or you can send entries to the email address at the bottom of the page. To qualify, emailed entries must include the artist name, age, image title, and the original image. By sending your artwork submission you certify that you are the original creator and are granting Girls Horse Club the right to freely publish it at GirlsHorseClub.com. PART 2. SUBMISSIONS CLOSED on Sunday May 8th for fiction short stories inspired by the images in the Every Picture Tells a Story gallery. The best are published here on the blog. Your submission must be your original creation—100% written by you, inspired by one of the images in the Every Picture Tells a Story gallery. You may submit more than one story, but no more than one (1) story per author will be published. Authors must select an Every Picture Tells a Story image created by someone other than herself. In other words, don’t write about your own image submission. Use the Story Submission Form for entries. Submissions open Saturday April 23rd and close Sunday May 8th. PART 3. Readers (that’s everyone!) can vote for their favorite collaboration between artist and writer. To even the playing field, we’ll have two categories for voting (12 and younger, 13 and older) based on the age of the author. In a couple of cases the artist is in a different age category than the author, but we’ll stick with using the author’s age for categorizing as it seems the most fair. Voting ends on Tuesday May 31st at 7:00pm Pacific Time. I will def be writing a story. Sometimes if I’m drawing a blank I use pictures to help write a story anyway so this will be fun. Awesome!! I will def be sumbitting a drawing ive been working on. Hope someone can use it for an idea!! =) be looking forward to seeing y’alls work! HF- I will be hoping to see your drawings! I have several pictures that I will probably submit, or maybe a photo illlustration. By that, you mean like the pictures that are at the top of this blog and the top of the webpage, right? Also, after the stories are written will the people that submitted art be able to say what actually happened in the picture? Like the horses names, and what was going on at the time? Yep. As long as all the photos used in the illustration are 100% yours, you can submit one like in the banner at the top of the page. I would refrain from adding text to it though, since a picture’s worth a thousand words. Likewise, I would also refrain from giving that information away. What makes this contest fun is that your picture will inspire a new story, and the less information given about it, the more our imagination’s can create a new story inspired by the image. Could I submit a photo of a horse I took, with some photo shop? to repeat ChEeSeYhOrSe=D, good luck everybody! Has the date for part 2 been set yet? HorseFeathers, we’re not planning to have a vote for the artwork alone — just a vote for the collaborations between artist and writer. Not sure it’s necessary to separate that vote by the type of artwork, but that’s something to think about as we get closer to part 3. Thanks for the suggestion! Ah cool (: So we can enter a photo that’s edited? Without a story? Caroline: As mentioned in the blog, dates for part 2 submissions will be given after part 1 submissions close. Deas Vail: Yes, submitting photos, edited or not, is part 1 of the competition. Part 2 is where a story is submitted. Could you or somebody help me. I’m new on GHC and I’m lost like, where is every thing???? Neighgirl, sorry no one responded earlier, but welcome to GHC! I’m not sure what you mean by “where is everything” but if you browse the blog you’ll see there are hundreds of horse tales — fiction, non-fiction and poetry — written by horse girls.You should check out the links under “ABOUT THE GHC BLOG” for more info about how things work and answers to frequently asked questions. Enjoy! Thank you so much LeadMare!!! I went to submit my photo, but it said it was too big? So how would I fix that? Toppyrocks, here’s a site that lets you resize a photo: http://www.shrinkpictures.com/. Or you can email it as an attachment to the address at the bottom of the page. Be sure to include all the info from the application form — name, age, image title, and confirmation that you understand the submission policy. Thanks for your interest in participating! Thank you! I’ll do that as soon as I get home. The pictures and drawings in the gallery are awesome! Are there only going to be 8 pictures or are you going to post more? I am definitely going to enter a story! I am so happy for this oppurtunity beacuse I am a author and have wanted to be published for a long time even if it is just online on a website! Yay! HealingHorses, a word limit is not stated other than we’re looking for short stories. Click here to see how Wikipedia defines a short story. Also see our Submission Guide for info about what we look for when considering a story for publication. I hope this helps! And I’m looking forward to reading everyone’s submissions! How is the voting going to work? Yay! I entered! I’m so nervous that nobody will like my story, though. Oh, I really hope that it gets published on the website! DragonRider, don’t be nervous. We’re a friendly herd, and if you put your best into creating a story inspired by one of the Every Picture Tells a Story gallery images, odds are good you’ll get published. Thanks for your interest! HeartlandLover, 3,000 words is fine. See comment #31 above for more info. Yup Raven this contest is totaly swanging man! =) You can still write a story if you want its not too late. Leadmare, when does the submission form for the stories close? icehorse, please read Part 2 above — it has details about this phase of the contest. Hay Girls! Part 2 story submissions have closed, and the editorial team is finalizing review and editing so there are more stories to come. Voting details will come once all stories have been published. Enjoy reading the entries! just finished my story. I’m a little late though… but i can’t wait to read your stories when i get back from outdoor ed! I’ve entered my story too! Good luck to everyone who submitted a story =] I hope they all get in! Thank you LeadMare and caroline! You guys are so sweet! I’ve got alot of inspriation. Im watching this new horse show. Best show ever. I love it. It’s based on theses books. The Heartland series. I love those books. I am going to take a picture of my friends horse Fudge and try to subbmit it. Theses are awsome contests!